The ChargeHub is a 7-Port USB Universal Charging Station with the ability to charge 7 devices simultaneously. It utilizes patent-pending SmartSpeed technology that provides optimal charge for virtually any USB chargable device. The ChargeHub can become portable with the Vehicle Power Cable and be used in variety of places from home and work, as well as on-the-go that includes cars, trucks (including commercial), RVs, boats, and most airplanes! The Super Value Pack is compact and ready to charge virtually any 7 USB devices fast with 2.4amp max output per port or 8.8 amps overall. 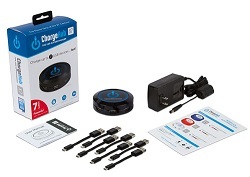 The ChargeHub X7 Super Value Pack includes 7 of the most popular cables and 1 Vehicle Power Cable to charge up to 7 simultaneously connected mobile devices. Perfect for the office or on the road! You can even use the FREE ChargeHub Design Studio to customize the top insert with your photo, favorite logo or artwork.